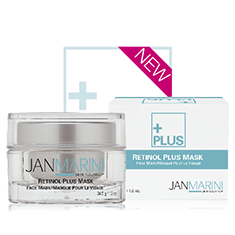 Amplify the results of any homecare routine with Jan Marini Retinol Plus Mask. The mask’s delivery system increases penetration of multiple advanced technologies for long-term benefits while resurfacing agents smooth and refine the surface for a brilliant polished appearance. Retinol Plus Mask addresses the appearance of fine lines and wrinkles, sun damage, hyperpigmentation and acne. Used 1-2 times weekly, it will enhance the results of any skincare routine. High concentration Retinol, anti-aging peptides and antioxidants penetrate the skin for dramatic improvement in the appearance of sun damage, fine lines and wrinkles. Essential fatty acids, hydrators and barrier lipids moisturize and condition the skin.